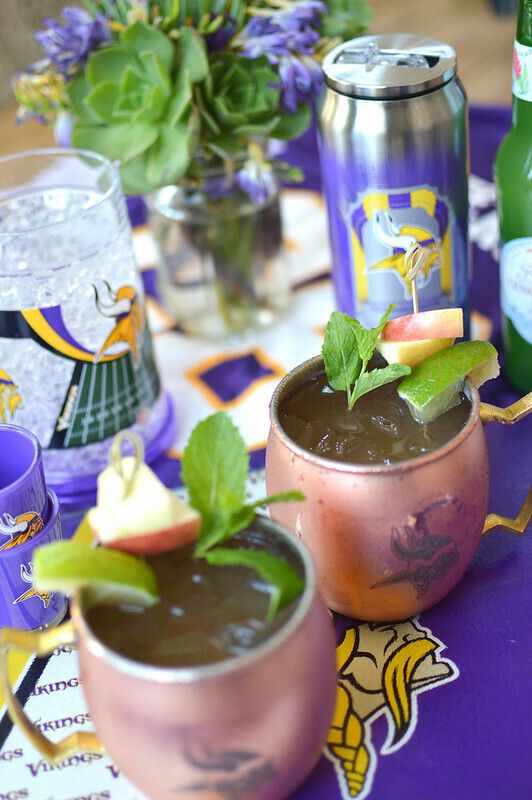 Apple Moscow Mules — SKOL! By now y’all may have recognized my rather intense allegiance and unwavering devotion to my sports teams. Sure….some may call it an obsession but I like to think of it as loyalty. I love my VIKINGS and TROJANS. I bleed Purple and Gold AND Cardinal and Gold…..simultaneously! I’m a proud, proud fan. I talk the talk… I wear the gear….and I got all the goodies. For years, Duck House Sports has been fulfilling all my fanatical needs to ensure that there’s never a doubt who I root for. And I’m not talking about just your basic stuff you can pick up at your local sports store. We’re talking about Drinkware, Kitchenware, Cookware, Candles, Electronics, and even Ottomans—all printed with the logos/seals of my beloved Vikings and Trojans! 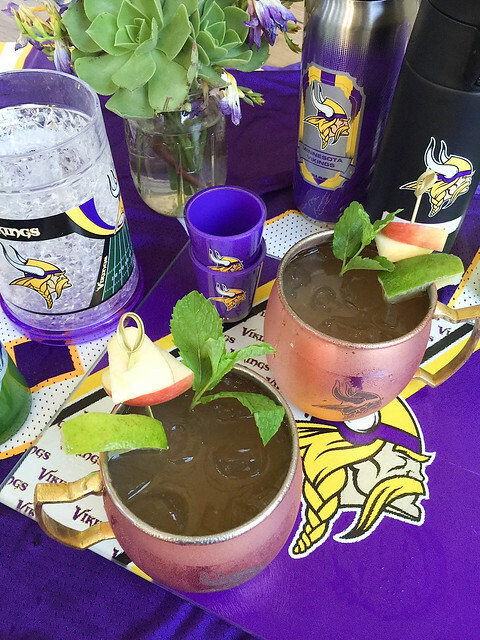 My latest acquisition that I am truly OBSESSED with are these freaking awesome Copper Moscow Mule Mugs that have the Vikings logo etched into them. Anyone who knows me, knows how much this gal appreciates a Moscow Mule. 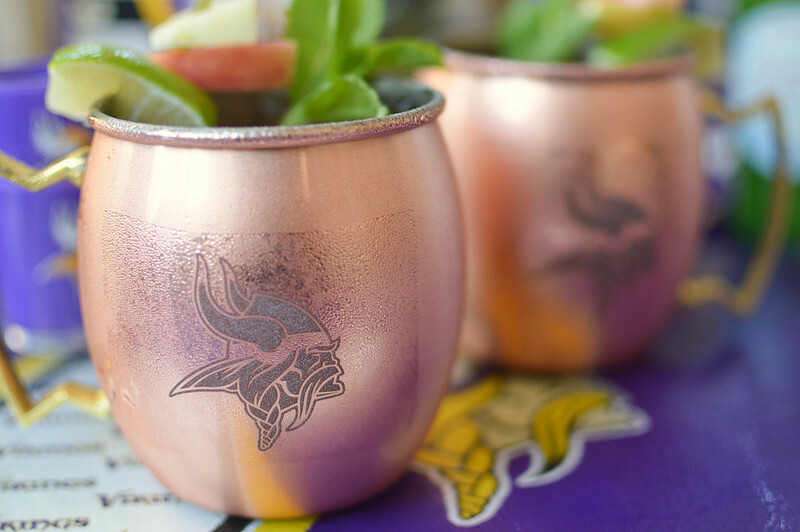 So when it’s served in a true copper mug with her beloved NFL team–it’s cause for celebration! 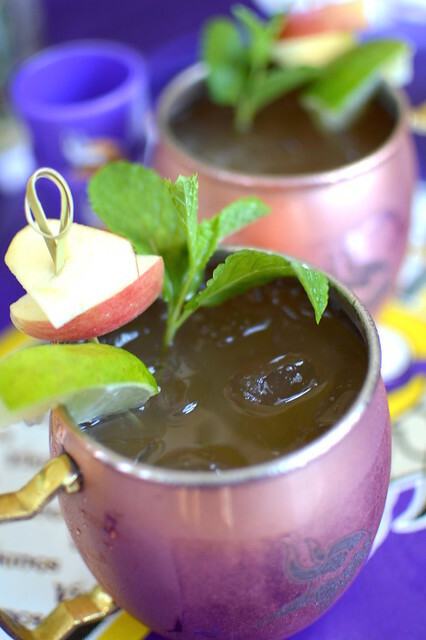 To break in my new mugs, I decided to make a few rounds of Moscow Mules….but with an Autumn twist to fit the season. And what is more Fall than apples? Instead of plain vodka, I used a few ounces of apple flavored vodka and added some apple cider to the party. I opted for the Gala Apple flavored vodka from Stolichnaya which is a seasonal item for them. It has a light fragrance and I adore it. But one thing remains true for this mule version as with the old–you’ve got to use a ginger beer with a bite. If not, it’ll be way too sweet and that’s just is really no bueno. If you’re wondering, I’m not being compensated by Duck House Sports for singing their praises. I just really LOVE all their stuff so if you admire a sports team the way I love my Vikes and Trojans, go check them out so you can step up your fan game. Have a great weekend Friends and SKOL!!!!!!! Fill a Mule mug (or glass of your choice) with ice. Pour the vodka, apple cider and lime juice over the ice. Slowly pour the ginger beer into the mug and stir. 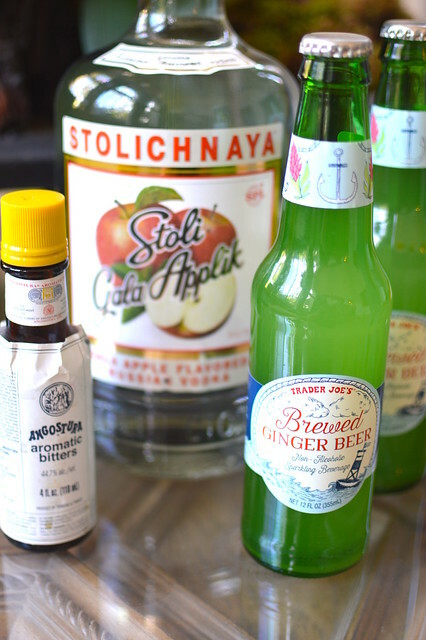 Add the dashes of Angostura Bitters to the top and garnish with apple slices, lime slices and mint sprigs. Next Post Our Fishermen Bring it in for Family Dinner!